Bread is the best, right? I love me some whole grain goodness! From the outer layers of my tempeh BLT to baguette slices for tapenades to a loaf for ripping and dipping, I just can’t get enough. So what’s the staple in my fridge? Alvarado Street Bakery. 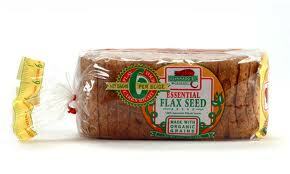 Specifically, I’m talking about the Essential Flax Seed bread. It’s got a great whole grain taste perfect for sandwiches of all kinds, plus it’s full of omegas from the flax seeds, AND it’s got only 50 calories a slice. Winner! Keep in mind that not all of Alvarado Street’s concoctions are vegan, so read your labels, folks. However, I can assure you that the Essential Flax Seed contains only goodness. So eat up.. and stay tuned for my post next week when I tell you all about my new favorite thing to slather all over a slice! ← Sweetness from the sunshine state!